Last major update issued on September 12, 2015 at 07:15 UT. The geomagnetic field was unsettled to severe storm on September 11. 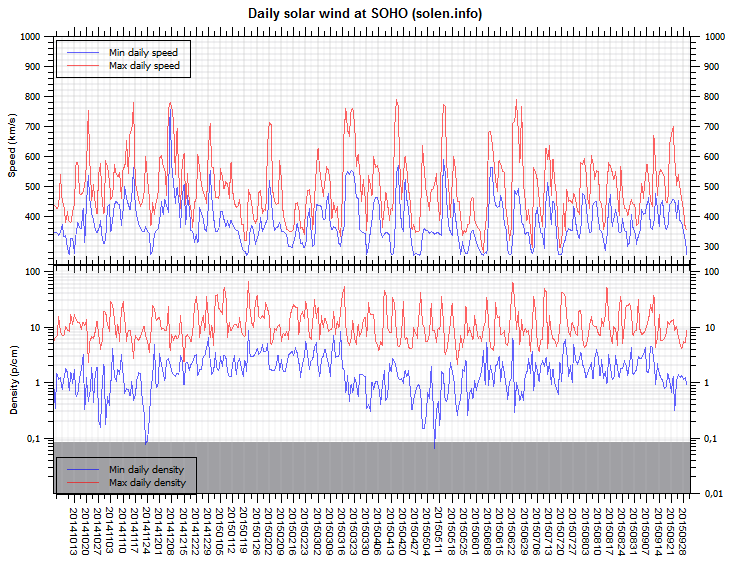 Solar wind speed at SOHO ranged between 381 and 666 km/s. While there was no evidence of a CME in solar wind data, an analysis of the most likely sources of the strong disturbance points to CH689 and a co-rotating interaction region ahead of the western and southern parts of this very large coronal hole. Both the high solar wind speed and the timing of the disturbance compared to the leading edge of CH689 makes this the most likely explanation. 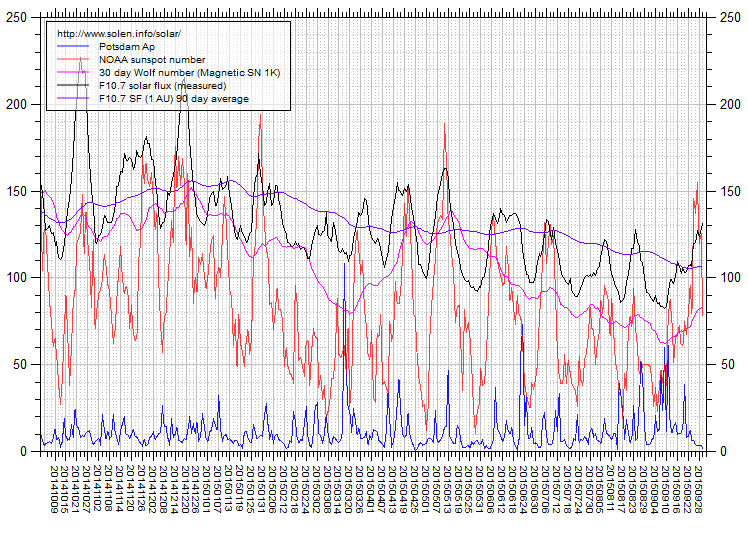 Solar flux at 20h UTC on 2.8 GHz was 92.8 (increasing 2.6 over the last solar rotation). 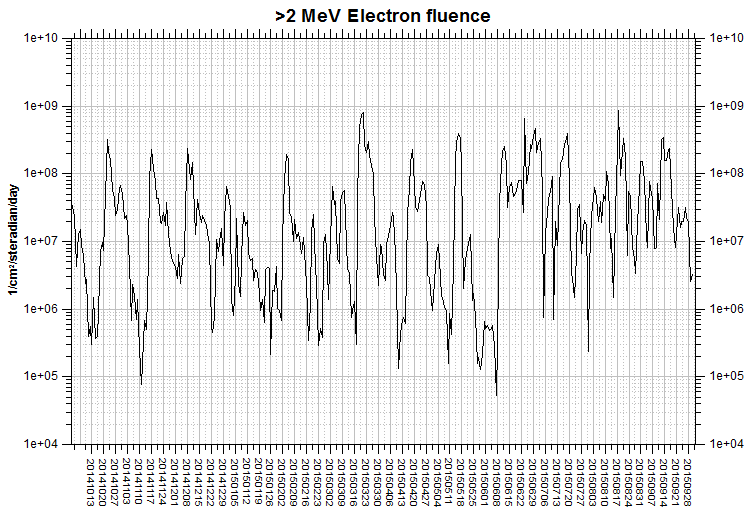 The 90 day 10.7 flux at 1 AU was 109.3. The Potsdam WDC planetary A index was 55 (STAR Ap - based on the mean of three hour interval ap indices: 54.9). 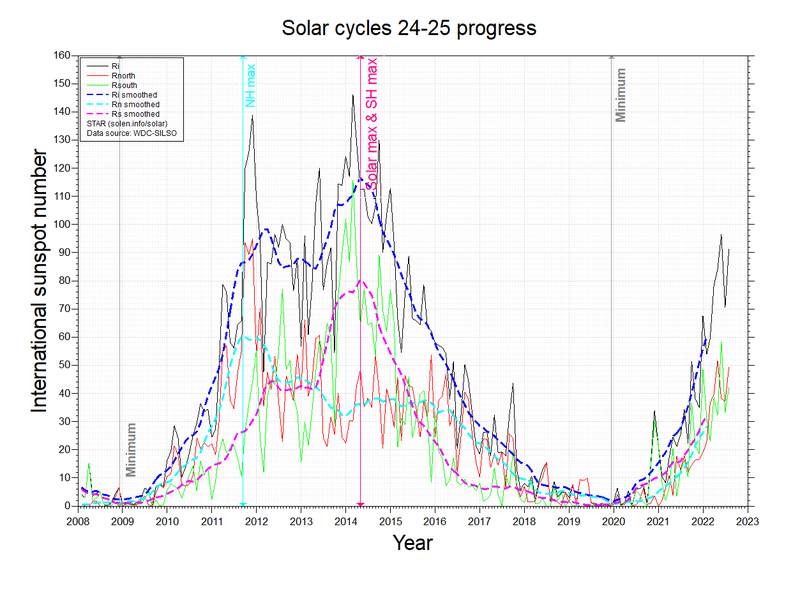 Three hour interval K indices: 34765734 (planetary), 26554533 (Boulder). At the time of counting spots (see image time), spots were observed in 9 active regions using 2K resolution (SN:161) and 9 active regions using 1K resolution (SN: 128) SDO images on the visible solar disk. Region 12411 [N14W27] decayed slowly and quietly. Region 12412 [S07W08] decayed slowly and quietly. 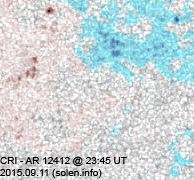 Region 12414 [S10W19] developed very quickly as flux emerged rapidly. 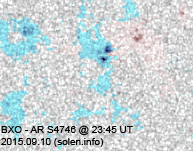 Weak polarity intermixing is observed and there is a minor chance of a minor M class flare. 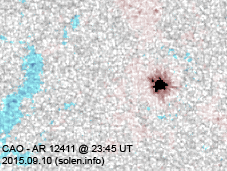 New region 12415 [S21E69] rotated into view on September 10 and was numbered by SWPC the next day. C flares are likely and there is a minor chance of an M class event. 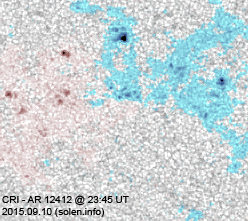 New region 12416 [S12W36] emerged on September 10 and received its NOAA number the next day. S4743 [N21W04] was quiet and stable. S4746 [N23W36] was quiet and stable. 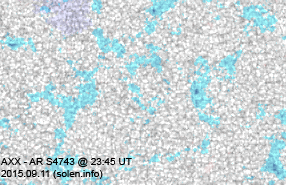 New region S4752 [S00E50] emerged near the equator with a penumbra spot. New region S4753 [N10W73] emerged near the northwest limb with penumbra spots. September 9-11: No obviously Earth directed CMEs were observed in available LASCO imagery. 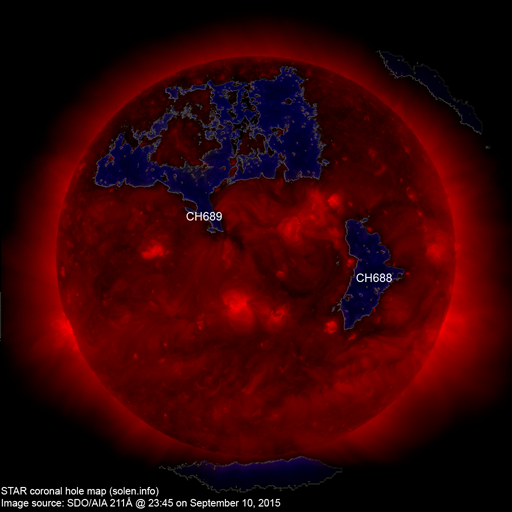 A large northern hemisphere coronal hole (CH689) will be in an Earth facing position on September 9-14. The geomagnetic field is expected to be quiet to active on September 12-17 due to effects from CH689.